Continental European before 1800 29 comments Who painted 'An Old Philosopher'? I have studied the work of Godfried Schalcken for over 40 years and I can say almost with certainty that this painting is not by Schalcken. 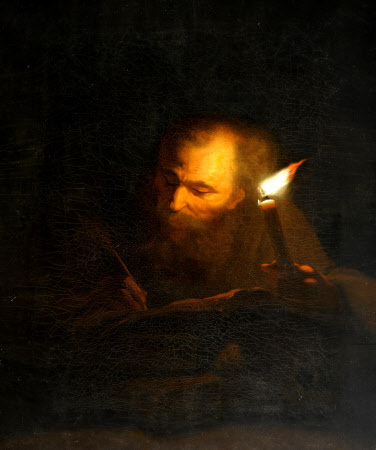 The style is all wrong and in particular the flame has been treated more in line with Gerrit Dou (who was Schalcken's teacher) – it is rather elongated, and the glow is defusing differently to how Schalcken may have treated it. There is iconography of course requiring closer inspection, and the arrangements of the items and drapes are non Schalcken-esque. Maybe the work of Arnold Boonen (1669-1729)? This looks like a relatively crude copy, whether of Schalcken or someone else. Very interesting discussion. Boonen of course was a pupil of Schalcken. However, I believe this 'Old Philosopher' belongs to an earlier period c.1640/50 - the mature work of Rembrandt - Dou period. We do have a wonderful comparable work located at the National Trust's property Calke Abbey in Derbyshire. Comparable in a sense that the subject matter is similar though the Calke Abbey work shows how Schalcken treated not just subject, but his trademark candle/flame and illumination of. The Calke Abbey work is in need of some restoration (when last viewed a few years back). I am wondering what Wayne Franitis may make of this? Unless this picture has been poorly "restored," the crudeness of the painting is incompatible with an original work by one of the Leiden Fijnschilders such as Dou or Schalcken. Is this not an example of a Vanitas painting, containing all those usual elements of an hourglass, open book, candle, globe, skull and the serpent emerging out of the tumbled vase or urn on the front left-hand-side? There is something watered-down, weak and hazy about this picture which makes me suspect a rather late and tired remake. It might even be by a "follower of" Versteegh. To the lower left is something that looks like a dog but on turning the picture to one side it becomes clear that this is an urn or vase tipped on its side and from which Keiran Owens notes a serpent emerging. The picture is not very clear but the Philosopher holding a small animal in the cusp of his left hand or is this an optical illusion. Isn't the object in his left hand a skull - which would be appropriate if the work is meant to be a vanitas? Yes, it is a skull, albeit positioned in a somewhat visually ambiguous way. I see that the Warrington collection includes many 19th century copies of older works, including some Dutch pictures, made by Thomas Robson. Could this picture be one of his copies? There is, apparently, a 'Warrington Museum Receiving Book, 1880 - 1914'. If this is a comprehensive list of the Museum's accessions, could the Museum please us give all the available details regarding their acquiring of this painting? There is indeed a Warrington Museum Receiving Book 1880-1914. This is not, however, a list of the Museum's Accessions. A receiving book is a historic equivalent of an entry book that records things that people brought in, loans etc. The document you are looking for is an Accession Register - a document that all registered museums in the UK must possess. I actually gave the details of the acquisition of this painting in the preamble to this thread. Apologies, I submitted before I was finished. I enclose an image of the register entry for the painting from our accession register for 1902. 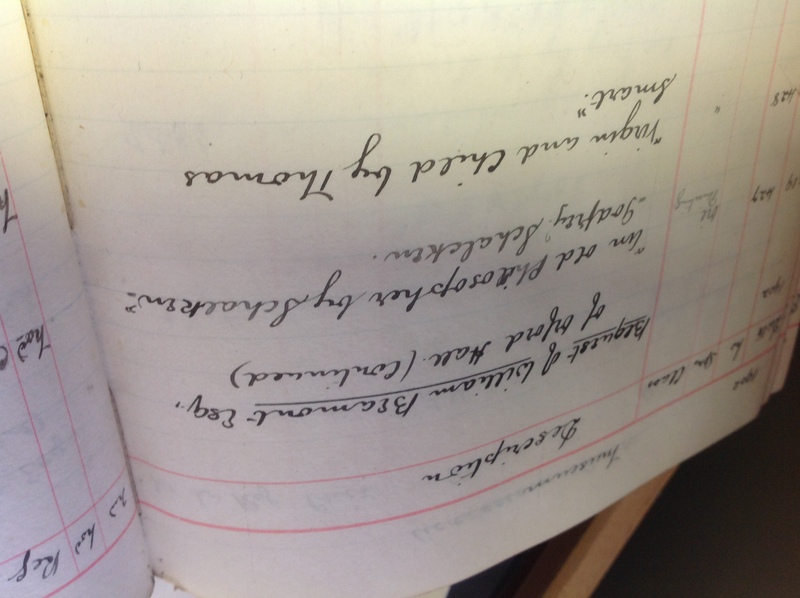 19th December 1902 Bequest of William Beamont Esq of Orford Hall (continued) 1902.427 [this is the accession number] "An Old Philosopher by Schalken", Godfrey Schalken. William Beamont (https://en.wikipedia.org/wiki/William_Beamont) was a local solicitor, the first mayor of Warrington and was one of the present museum's founders in 1848. He was an antiquarian but his main areas of interest were archaeology and history rather than art - although he collected paintings he was not an art connoisseur as far as we know. The collection does contain a number of copies of Old Masters by Thomas Robson (1798–1871) who is a rather tragic local figure who never really reached his early promise. These paintings by Robson were, however, donated en masse by Robson's family after he died. It's not impossible that Robson would have copied a Schalken and it's not impossible that such a copy could have found its way into Beamont's possession. What would help in establishing this would be if someone could trace an original of 'Old Philosopher' that Robson had copied - most of Robson's copies are of works in well-known 19th century collections i.e. Dulwich Picture Gallery, Grosvenor House the National Gallery etc. Ian, I appreciate that you did give the said details and thank you for them. I was more wondering if there were other details not included and in that regard I appreciate your sending the image from the Accession Register. In that same spirit of minute enquiry, were there any labels or writing on the back of the frame or canvas? Sometimes the most innocuous marks or script can lead to the most wonderful revelations. 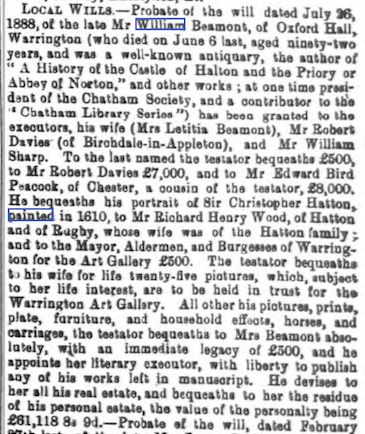 The attached newspaper report of the probate of William Beamont's will, from the Cheshire Observer of Saturday 17th August 1889, might be of interest. I asked about Robson because even though most his copies were given to the museum in 1877, at least one (of a Magdalen by Guido Reni, WAGMG : 1902.413) was given in 1902, the same year "An Old Philosopher" was given. Was the Reni copy also part William Beamont's bequest? Thank you, I had not seen the probate report before and it is definitely interesting in that it confirms that 25 of the paintings that were bequeathed to the museum were held by Beamont's wife until her own death, which would go some way to explain the 13 year gap between Beamont's death and the accession of 25 of the paintings into the collection in 1902. The "Schalcken" is one of these 25 paintings. The painting is captioned "A Old Philosopher, Godfried Schalcken, Beamont Bequest" on the front of the frame and someone has written "Godfrey Schalcken" on the rear of the frame. The rear of the painting is sealed and so I cannot read the rear of the canvas without un-framing it - something we are not willing to do without the intervention of a conservator. In November 1838, the auctioneers Brearey & Eyre were instructed to sell the paintings, drawings and engravings from the estate of Mr. George Tunnicliffe, of Derby. One of the works was "St. Luke, a candlelight effect" by Schalcken, "a large and first class picture...". It started me wondering. If our discussion's work is actually by Schalcken (or even it is by a different artist), could it be one of a series of paintings of the Evangelists. The most obvious one would be St. John, writing his gospel and contemplating mortality, but also sitting in front of an admittedly over-sized chalice, the poisoned one that features in almost all the classical paintings and icons of the saint, and which invariably features a serpent writhing in or emerging from that vessel. If the plant growing out of the vessel was identified as a poisonous one, perhaps this idea might have some credence. By the way Warrington Museum, are there additional elements or details in the top and right-hand-side areas of dark paint that are not visible through the surface varnish, and certainly not by way of the ArtUK image, but which might emerge after a good cleaning or restoration? I think St. John is quite unlikely, Kieran. Much too old, I should think. A St. Jerome is possible, however, although I'm not convinced. Apart from Jesus and the Virgin Mary, aren't all of these biblical characters variously depicted as young and then sometimes old people depending on the era and the religious context? Do bear in mind that he was supposedly born in c.AD 15 and died c.AD 100, so he did live for 85 years. As one entry online puts it: "John is traditionally depicted in one of two distinct ways: either as an aged man with a white or gray beard, or alternatively as a beardless youth. The first way of depicting him was more common in Byzantine art, where it was possibly influenced by antique depictions of Socrates; the second was more common in the art of Medieval Western Europe and can be dated back as far as 4th century Rome. All that said, Jacinto, you are most likely correct and that it is not him. I'm just attempting to decipher the elements of the painting and to stimulate some wider considerations. The question is what was customary in 17th century art, and both van Dyck and Rubens went considerably younger, as I believe was the case in general in that period. However, I remain unconvinced this is a picture of a religious figure, although that is possible. Jacinto, I'm sure you are correct, as works like Karel van der Pluym's (Leyden 1625 - Leyden 1672), 'Scholar in his Studio', has almost all of the same elements. In fact, a web search for the term 'Scholar in his Studio' returns a myriad of similar works. Perhaps this discussion's one is just a variation on a very well-worn theme. Maybe they are all essentially Vanitas presentations. Well, I suppose we should focus on who painted this. I cannot find a Schalcken of which it could be a copy, and I certainly don't think it is by Schalcken's hand. It may not even be 17th century but later, quite possibly 19th. How about a depiction of the aged Faust? "By the way Warrington Museum, are there additional elements or details in the top and right-hand-side areas of dark paint that are not visible through the surface varnish, and certainly not by way of the ArtUK image, but which might emerge after a good cleaning or restoration?" The painting actually seems much darker to the eye than it does in the Art UK image and I cannot see any additional details at top right hand. We do not have an art conservator on staff so we couldn't clean or restore it without securing funding for an external conservator, sorry. This is certainly not by Schalcken. The quality to begin with is not sufficient and it lacks the warm coloring. 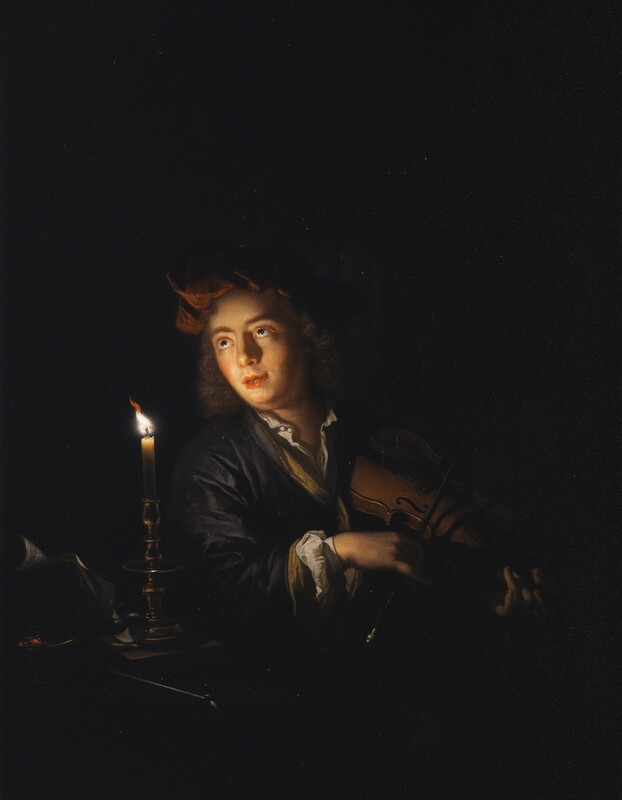 It also deviates in quality and style from Schalcken's pupil Arnold Boonen. The quality is such that it may be impossible to attribute it to a known and documented master by whom other, signed works are preserved as a reference. This portrait of an aged philosopher depicts him seated at a desk covered with books in what appears to be his study. The scene is lit by a single candle on his desk.